After hearing my friend rave about how great an SSD made his laptop, I went down the upgrade path instead. From what I could gather online, the X61 should support 64-bit Windows 7, SSDs (with a 1.5GB/s SATA cap) and, unofficially, 8GB of RAM. I had become accustomed to working under 3GB in Windows XP even for development work which was brutal so the RAM looked like it would be a huge boon. There it is! Basically the X61 has two SODIMM slots and while the manufacturer officially supports 4GB RAM total, the hardware actually supports 8GB. I used 2 of these Patriot PSD24G8002S 4GB PC2 6400 800mhz CL6 DDR2 SODIMM modules at $55/ea for a total of $110. Corsair has an equivalent VS8GSDSKIT800D2 kit for $130 but memory is more or less a commodity so I went with the cheaper chips. One of the two Patriot modules was defective and wouldn’t POST but Amazon’s awesome return customer service worked like a charm and this morning my replacement stick showed up. Technically the Thinkpad uses PC2-5300 CL5 memory but it’s difficult/impossible to find in 4GB sticks and the newer, faster memory can “slow down” to work. The other department where I needed more zoom was the hard drive. I replaced the internal drive with the 256GB Crucial M4, the latest and greatest generation of SSDs. Even though the hardware doesn’t support the full 6GB/s SATA capability of the M4, I decided to get the fastest drive possible now, so that I could transfer it to a newer laptop down the road. 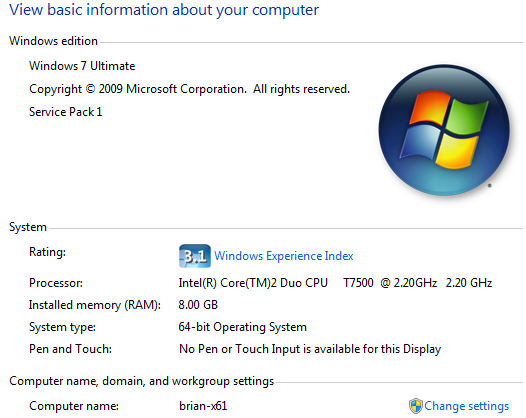 Finally, with the new hard drive I took the opportunity to move to Windows 7 64-bit. I’ve actually had 4GB of memory since I bought the Thinkpad but Windows XP could only access 3GB of it. Moving to 64-bit ensured that I could use the full 4GB immediately and 8GB later. I disabled some of the Aero features to improve graphics performance (the low score in my Windows Experience score) and reverted back to XP’s ALT+TAB behavior and I’m happy with the results. Having used it for a few weeks now, the speed improvements are stunning. Boot time and hibernate are dramatically shorter and applications pop on the screen as soon as they launch. Interestingly, my development work doesn’t process that much differently because it’s processor-bound but the improved disk access time and throughput clearly assists all kinds of applications from creating zip files to loading PSDs in photoshop to copying large files from the network. Total spend was $115 (RAM) + $425 (256GB Crucial M4) + Windows 7 64-bit (Free from friend) and I have what feels like the latest and greatest computer in the same lightweight footprint. Success! Side note: If you feel that 1.5GB/s SATA is really killing your day, there is an unsupported, unofficial, totally-may-screw-your-computer BIOS upgrade for 3.0GB/s SATA-II available in this thread. PS – I use CrashPlan to backup my home computers and it made transitioning to Windows 7 easy. I’ve already restored files twice from my XP install that I had failed to migrate. At the moment I have two computers backed up in Crashplan, my X61-XP and now my X61-W7. It’s great being able to go back and get files from the old machine – highly recommended! I have been working on a nearly identical upgrade to my X61T for the past month. I wanted an iPad but figured I’d go this route first. I would not save any money, but I would end up with a different and broader solution. My tablet has the 1400×1050 screen- in a 12″ screen. That and many other reasons marry it very well to Windows 7, and even though nearly four years old, the device feels very modern. 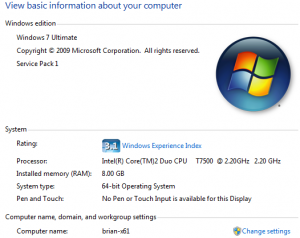 I flashed the BIOS to the ‘blacklist free’ 1.25. It makes a difference. The only things left to upgrade are the wireless card and battery- and that is more a replacement instead of an upgrade. The last TWO slice batteries that I have found “new in box” have been dead. Enjoy. I have been training my Windows 7 tablet software to recognize my handwriting- and the device performs better now than when I got in. Thanks for the feedback Jeff. Is the blacklist-free BIOS update the one that removes the SATA cap or is it something else? The bios I installed removes the artificial SATA cap and removes too the “no boot” blacklist for WAN cards (one must use particular PCI ID’d cards in the 61, or it won’t boot- unless one uses the ‘correct’ BIOS). I am looking up the right FRU for the WAN card: 42T0867 looks like a good bet.